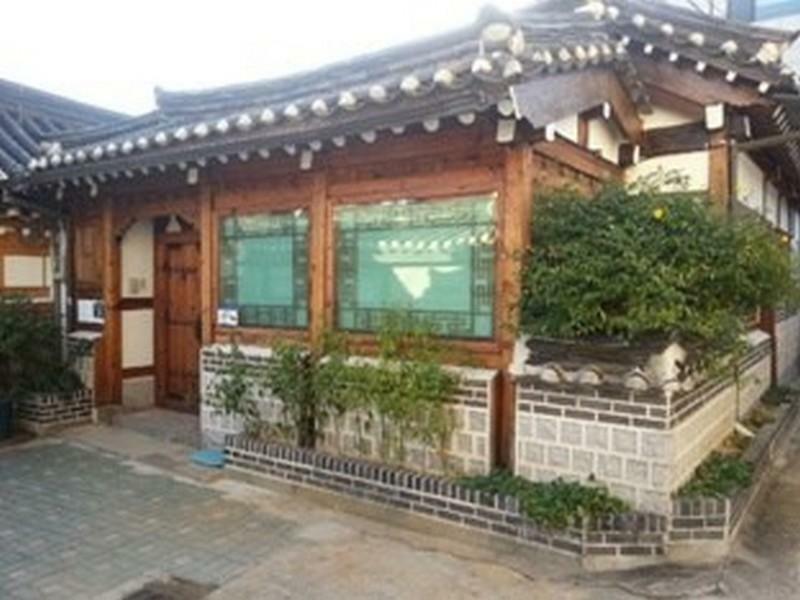 Имате въпрос към Bukchon Sarangchae Hanok Guesthouse? Реновиран през 2014, Bukchon Sarangchae Hanok Guesthouse гарантира на своите посетители приятен престой в Сеул независимо, дали са тук по работа или на почивка. Хотелът не е далеч от центъра на града - намира се само на 0.5km от него, а до летището се стига за около 60 минути. С удобното си местоположение хотелът предлага лесен достъп до всички градски забележителности, които задължително трябва да се видят. Възползвайте се от богатството на ненадминатите услуги и удобства в Сеул. За удобството и комфорта на гостите хотелът осигурява безплатен WiFi достъп във всички стаи, съхраняване на багаж, Wi-Fi връзка в общите части, семейна стая, екскурзии. Атмосферата на Bukchon Sarangchae Hanok Guesthouse се усеща във всяка стая. Удобства като телевизор с плосък екран, безжичен интернет достъп (безплатен), стаи за непушачи, климатик, отопление са само някои от даденостите на обекта. През деня можете да се насладите на отпускащата атмосфера благодарение на градина. С перфектното си местоположение и несравними удобства, Bukchon Sarangchae Hanok Guesthouse е един чудесен избор в много отношения. The owner Mr Sun was really helpful and upgraded us to a family room with a attached bath. My family enjoyed the experience of staying in such a historical house. The breakfast, bibimbap, prepared by the friendly staff was also an experience in itself. The onwer also helped us with an early morning taxi booking to the airport at the end of our stay. Most of all the area around was quiet and there were many lovely shops that sold locally made clothes, jewellery, souveniers. Not to mention all the quaint little cafes as well. We also found the place not to be so crowded and busy as Myeongdong. Highly recommended -not just a place to sleep but experience as well! 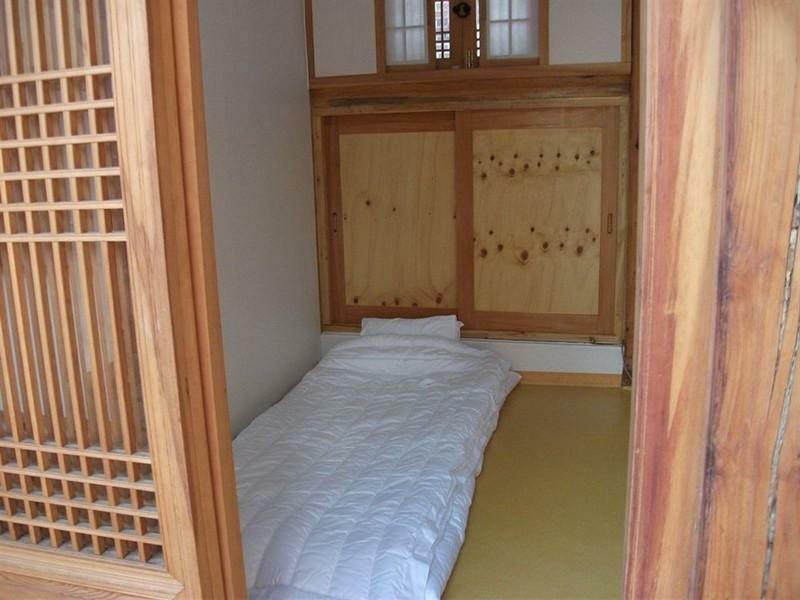 Rooms in Hanok are quite small and they charge by head count not by the number of rooms. Also be expected to use a shared bathroom which is not attached to the building of the guest rooms. Those who travel with young children and elderly during snowy winter should pay attention. The host of the guesthouse is friendly. Guests will meet the old grandma who lives in the other part of the building when she opens her window (door) during the morning. She reminded us to switch off the light and change the slippers when leaving the bathroom. We had Korean traditional home-made breakfast at the courtyard (or inside the room during rainy days). Feel like home. Generally it was a nice experience. They charged my 2 year- old baby a same amount with adult . It made me surprise cause the baby has never been the subject of additional charged fee but here they said baby is sameThe room area was advertised around 20m2 but only 9m2 at real and they explained they calculated the area of garden also. Finally 5 persons of my family must stay at 9m2 room. It was terrible. I booked Sarangchae but the owner taked me to another guesthouse which is dirty and very small. Only when I asked him to take me to the property I booked that he taked me there. During the time I stayed there the male owner continously come in come out the beside room and made it very noisy without any explaint or caring about my family , ignored all our inconvinient. When I asked him to give me more 10minutes to feed my baby after check out time, he was very unhappy so that we had no choice but to go out . I WILL NEVER COME HERE AGAIN AND THIS IS THE MOST TERRIBLE EXPERIENT AT KOREA OF MY FAMILY. NEVER STAY THERE. + Very close to anguk station exit 1 (2 minutes walk), Close to gyongbokgung palace (5 mins walk). You can rent hanbok in front of the guesthouse. Owner very friendly and spoke english fluently, They have delicious bibimbab for breakfast, Please don't expect too much for the facilities, the rooms was very small , but its okay for me. 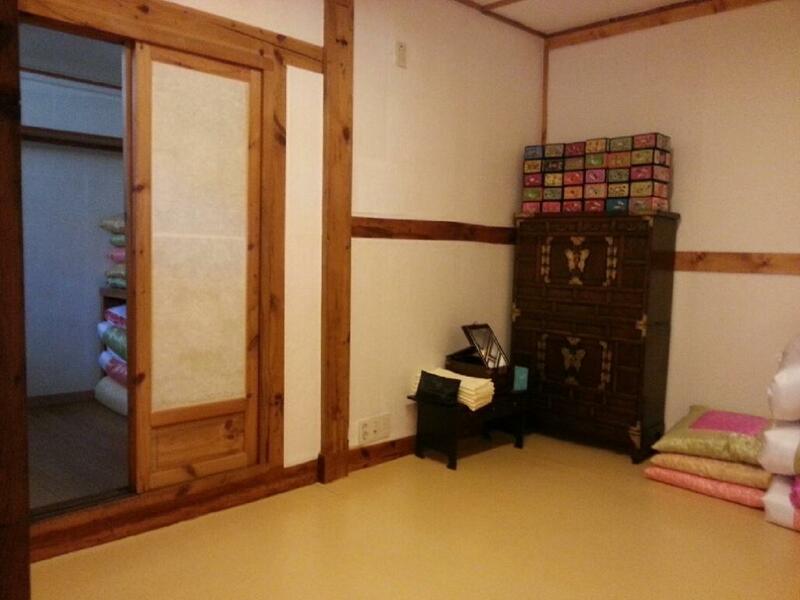 you would have a lovely experience to stay in the traditional Korean house. Good experience to stay in a Hanok Style guesthouse. Two toilets located outside and the weather is cold. Traditional and healthy breakfast prepared by a nice and friendly halmeoni, and you may have the chance to chat with local Korean guys. 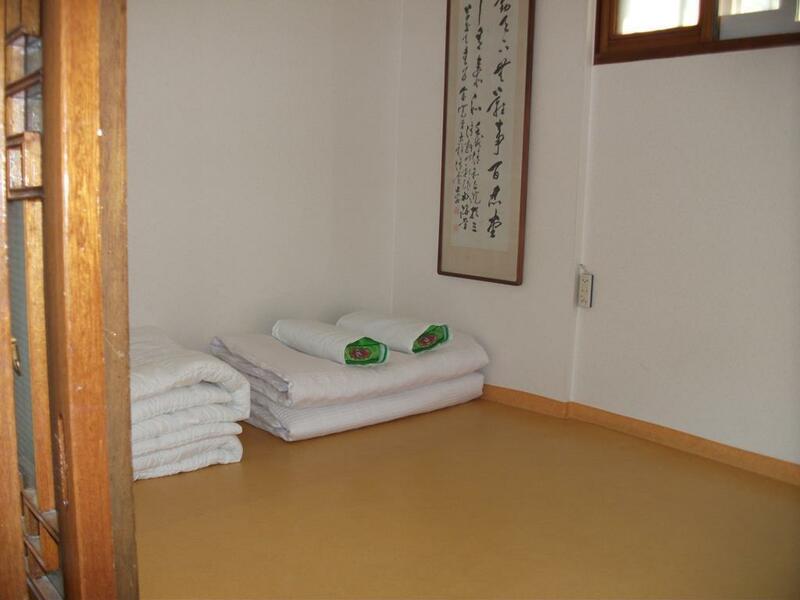 Feel comfortable and is a must to stay at least 1 night in Hanok Guesthouse. Location is good near hanok village and not far from Myeongdong and the river. Owner is nice and he prepares a simple but good Korean breakfast. 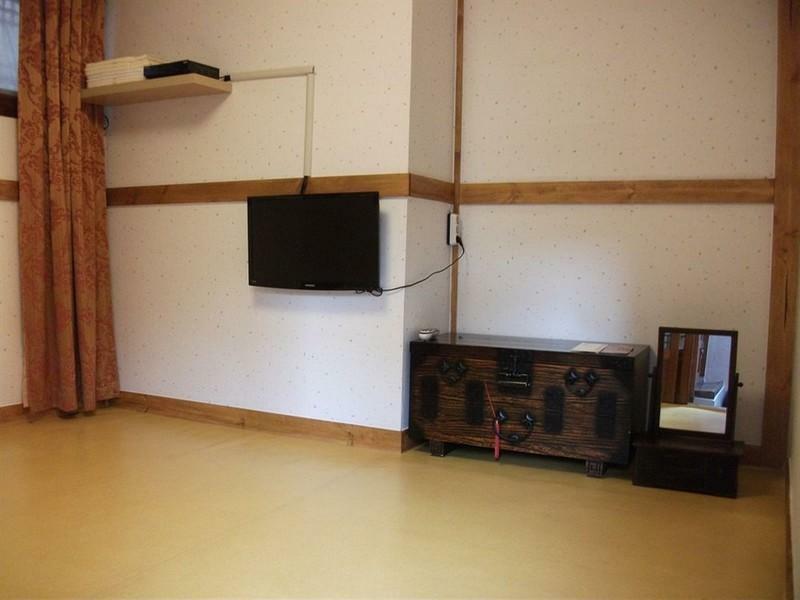 The room is however small (but this is normal for this type of house). It was also the first time I slept on a futon and hopefully this was the last time. This is so thin you really feel like sleeping directly on the floor. Another problem was that there was some construction near the guesthouse and so it was very noisy in the morning (the walls were even trembling). (1) Price is Ok. I use around SGD 45 to book 1 night single room, but need to share a bathroom. (2) Room is clean and tidy. (3) Location bit difficult to find, you must ask a owner actually location after booking. Maybe due to I pay in a promotion (cheaper rate). The room been provided was not as seen in picture. They bring me to another house. He claimed, the room is too small for us as all of us is very big size. However, I found the room is too small for 3 persons. We have difficult to open our laguage. It is just nice as single or double. However, the owner is very friendly. Breakfast provided is nice. The only things is, you have to follow their timing. Breakfast will serve from room to room guest. You are not allow to take breakfast earlier or later. The host is so nice that offered me with great help and led me to a big room enough for myself. A good choice to experience traditional Korean lifestyle. The only thing that someone may care about is the restroom, it's public, but for me, it's ok, it's a Korean traditional house anyway. We booked a Korean style double room at Bukchon Sarangchae Hanok Guesthouse. We had to walk through few back lanes and asked a local guy before we reached the door to be told by the owner that it is full. He sent and transfers us to Sodam Hanok guesthouse. A young lady gives us the key to a small room. We spread the 2 single bed mattresses on the floor and you are left with an area of a single mattress to move about and put your luggage. The TV is on top of a small cabinet at a corner. The Korean mattress is beautiful and clean. There are 3 small bowls of fried anchovies, kimchi and bits of fish paste to share on the breakfast table. The owner gives us each a scoop of rice on a plate. This is totally different from the breakfast advertised in the hotel website. My girlfriend and I stayed here. It was traditional and we were iffy on the room. But the mat and pillow were surprising comfortable and the style of room was a nice treat. The morning breakfast was a great touch of tradition. Walking around the historical Hanok Village is a must. The area is not strong with English though. It was an unforgetable experience to stay at this traditional hanok house. The room is equipped with futons, dressing table & air-conditioning system. Free and speedy wifi is available too. The washroom is public, next to the room. It is clean and free toiletory is provided. Breakfast is free and prepared by an Ajuma in the morning. She will nicely knock your door to wake you up for the breakfast. Breakfast provided is traditional korean stir rice with kinchi. Coffee and tea is also available for your own service. The house is near to the Anguk station. It is conveniently to walk to Insadong as well. The only disadvantage is that the room is not spacious enough for three adults. In short, it was an unique and comfortable experience for the stay. Friendly owner. Clean room. Good place to experience staying in Korean Traditional Hanok. Close to subway (about 3 to 5 mins walk). Airport bus stops very close to the guesthouse (next to subway exit). The owner is very helpful and has no problem communicating in English. She gave good recommendation of local attractions and made us feel at home. The guesthouse is clean and near to palaces, art street, shopping complexes and food. Transport to airport is convenient too. Highly recommended for people who would like to experience the lifestyle of traditional Korean culture and convenience of location. The location of hanok is hard to find. There is no signboard guiding you to the hanok. We took some times to find it. Other than that, the other things were satisfactory.